The first astronaut to view Earth from the International Space Station will be looking through a glass porthole developed by Dr. Karen Scott of The Aerospace Corporation's Space Architecture Department, Houston. From the U.S. laboratory module element of the space station, the 20-inch-diameter window will provide a view of more than 75 percent of Earth's surface, containing 95 percent of the world's population. Astronauts will conduct long-term global monitoring of Earth with remote-sensing experiments and with photographs taken through the highest quality optical window ever installed in a crewed spacecraft. 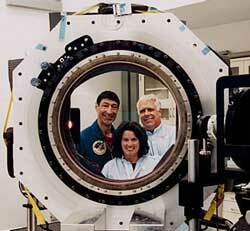 Scott has been the primary optical scientist for developing the window. She wrote the optical requirements, performed analyses, and conducted additional optical testing of the general-quality laboratory windows, informing management of the need for an upgrade. Original plans did not call for optical glass to be used for the Earth-oriented nadir window. General viewing glass, basically shuttle glass derived from X-15 aircraft window requirements and designed primarily to support pilots in landing the shuttle, was to be used. The glass, however, wouldn't support viewing with high-resolution telescopes or allow operation of precision remote-sensing instruments. Scott's upgrade of a four-piece window, now consisting of a thin exterior "debris" pane, primary and secondary pressure panes, and an interior "scratch" pane, was approved. A calibration test was needed to give researchers the necessary information to correct their data for the effects of the window glass on incoming light, and to determine what corrections would be required to carry out spectral remote-sensing research from the nadir window. Scott led a 30-member team from Johnson and Kennedy Space Centers, Marshall Space Flight Center and the University of Arizona Remote Sensing Group, which used $500,000 in optical instrumentation to make calibration measurements on the science window before installing it in the lab module. After a week of 12-hour test days, the lab window was determined to have the characteristics that would allow it to support a wide variety of research applications, including coral reef monitoring, the development of new remote-sensing instruments, and monitoring of Earth's upper atmosphere. Scott's efforts in completing the test on a tight schedule brought her a Johnson Space Center group achievement award. The Aerospace Corporation presented a group achievement award to Scott, a nationally recognized authority on optical windows in space, in 1991 for her work in improving optical observations for human spaceflight systems.